It would be nice if you put links to legitimate research before spitting out all of your misinformation. The French Bulldog is with us only because of a cross breed that has been repeatedly line bred. I think it’s a shame to lie just do that you can protect your vision of what a Frenchie should look like. It reminds me of Hitler with the Jew’s. French Bulldogs don’t carry the gene for merle, you nitwit (oh, and your vet is apparently also a nitwit, so at least it’s nice that the two of you can hang out, and nitwit at each other). Merle has been introduced into Frenchies by breeding French Bulldogs into breeds carrying the merle allele, Chihuahuas most commonly. 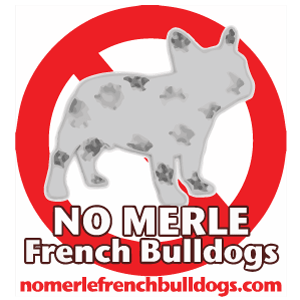 No French Bulldog breeder needs to ‘cull’ their merle puppies, because no breeder who isn’t intentionally breeding for them by crossing into a breed which carries them will ever have one show up. If they did, however, they’d just sell it as a pet on limited registration, instead of trying to market it as a sad little over priced money maker. I’m so glad I read this! Breeders are charging up to $10k for merle frenchies and I was actually considering one… not anymore!